I'm sure that anyone growing up in New England has his or her own recollections of snowstorms big enough to cancel school (please, God). Looking back now, I wonder if fate often stepped in, you know, having a heavy snowfall on the eve of that big arithmetic test you didn't study for, and if you only had an extra day to really study. 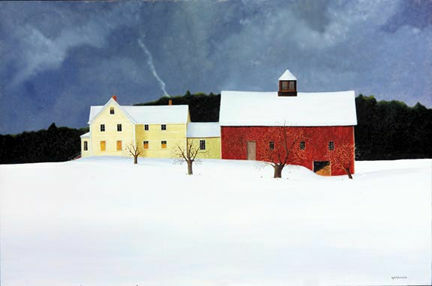 Marieluise exhibits regularly at Frank J. Miele, NYC, Tree's Place, Gallery on the Green, Woodstock, VT and Bayview Galleries in Camden and Brunswick.